The erection of the tannery was under the supervision of A. A. Clearwater, general superintendent of the large Wilcox tannery, also owned in part by the Schultz family. The leach house and the bark mill are in a building 35 feet by 250 feet long; there are two storage buildings 35 feet by 300 feet long each; the dry house is two storied, the building being 60 feet by 400 feet long; two other buildings, one being 30 feet by 80 feet long and the other one being 18 feet by 60 feet long. The latter two contain the boilers and other equipment. the brick stack is round, 150 feet high and contains 250,000 bricks. The Tannery Company owned the hemlock bark on 36,000 acres of timber land and contracted to purchase additional bark on the lands of Henry Bayard and Company involving many thousands of acres. The bark on the latter tracts is to be harvested by T.H. Quinn and Company who are operating a saw mill and chemical plants at Straight, and by Henry Schimmelfeng and Son whose saw mill is at Instanter. The Tannery Company is to pay Henry Bayard and company $5.25 per long ton for bark with an annual increase of 1/2 percent, out of which the Quinn Company and the Schimmelfengs are to be paid the sum of $3.00 for peeling and delivering the bark to the tannery. 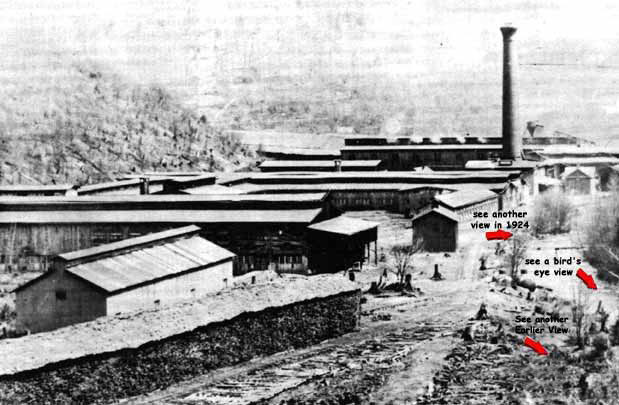 The Schimmelfeng mill also supplied the lumber for the tannery buildings at $6.50 per thousand board feet. The Tannery Company also built 29 tenant houses and three special dwelling houses the latter for the use of its management personnel. Additional tenant houses were constructed as were required. The company also built a store which it operated for several years, until it was sold to Smith Brothers Company of Ridgway. The Johnsonburg Hardware Company had the contract to install the water mains and fire plugs and all buildings were piped for running water. At this time a hose company was formed and fully equipped. However, in December, 1926, rumor became fact, as the Elk Tanning Company announced that its Instanter tannery would cease operations permanently on the twenty-first day of that month. It may be surmised that the gloom that spread over the town was very heavy. On that day the company ordered the whistle expired. This circumstance did nothing to help dispel the sadness that enveloped the community. Sometime later the large brick stack was undermined with a mammoth charge of dynamite, and immediately upon ignition, the 150 foot high sentry that had stood as a guard over the valley for thirty-seven years, collapsed in a gigantic heap of two hundred and fifty thousand bricks.